-An afternoon walk near the beach. -A new cookbook by Gwyneth Paltrow. -Going through old J. Crew catalogs. Beautiful day at the shore! hope your week's just as great! I love your casual look!!!! Taylor, you are so beautiful!! Glad you are feeling better. XO!!! Glad you are feeling better Taylor, this outfit looks amazing on you! Casual but yet you pull it out incredibly well! You look beautiful! 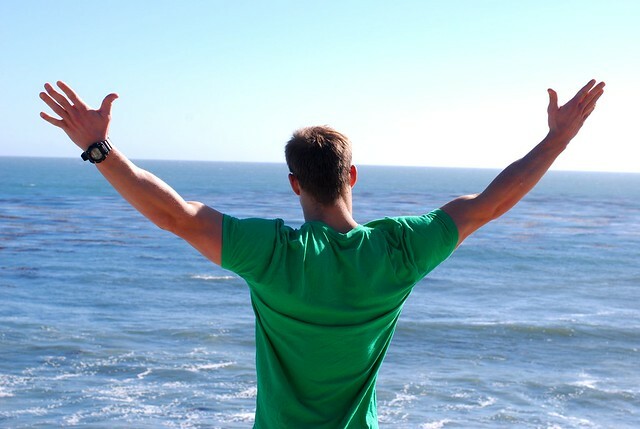 I would LOVE to know where your shirt is from, horizontal stripes are my weakness & I'm crazy about those colors. Sounds quite lovely! I will have to check out Gwyneth's new cookbook! Looks fabulous! I love your top! 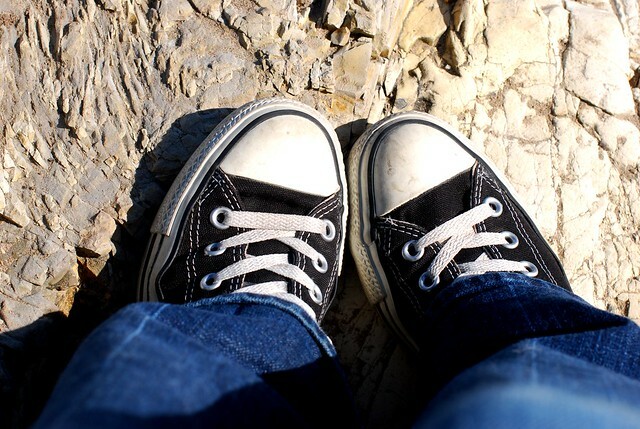 I wear my white converse sneakers (from the FABB conference) on the weekend all the time. And I just ordered some sparkly ones yesterday (finally) using my gift card! Win! What a wonderful weekend! I too, love your outfit, and those books! where did you get that awesome shirt from?!! Love it! aw looks pretty and fun :) you guys are adorable! i sometimes keep old j crew catalogs just like my old vogues! they provide so much fabulous inspiration-in both dressing and design! I've had those Chucks since college! I love them and they make me so happy!!! I have that Domino book and I love it!!! I'm glad your cold got better before the weekend was over. I've been hearing about how amazing the weather has been in San Francisco lately. What a great weekend! Looks relaxing and fun. Kinda like that cute striped shirt you're wearing! Love it! Wow, GP looks amazing on the cover of that cookbook and I love the title. I might have to pick this up. And aren't tulips gorgeous right now? They were all over the farmers market. Adore your tip. It's gorgeous. I need one for me. 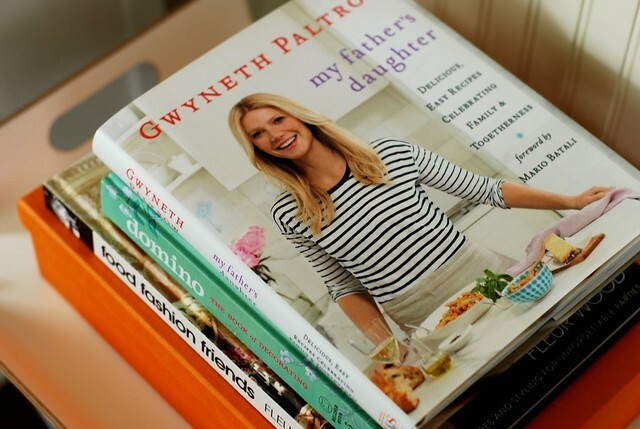 Do a post after you cook from Gwyneth's cookbook. I was thinking about buying it! im obsessed with the stripe top! I was wondering if you could do a post on your diet for the week...I know you are super healthy from reading your blog, but I'd love to know what you eat breakfast lunch and dinner for a full week to get an idea. I am kind of in a rut with eating the same foods. Thanks! The beach walk looks like a perfect day! 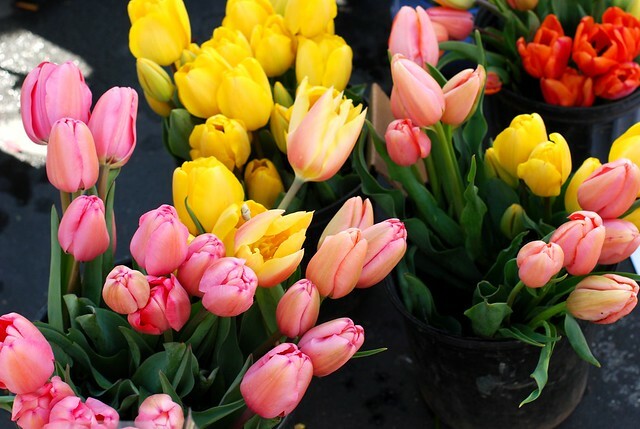 Love the tulips! You look super cute in your casualwear, doll. And how gorgeous is that coastline? I haven't checkout out Gwyneth's cookbook yet but I'm so excited about it! yay santa cruz! my hometown :) love the striped tee and converse, always a good look. ooh, let me know if gwyneth paltrow's cookbook is good! I got some fresh flowers this weekend as well. Something about having them in the house brightens my day! New follower here! Found you on Kendi's website today. LOVE your style and I look forward to seeing what you do with it everyday! How fun! I love that you're wearing converse. The best shoe ever! I love yout stripey top, you look fabulous!!! cute top! how do you like Gwen's cookbook? I have skimmed through Gwyneth's book and it looks great. I like her b/c she is very aware of things in food and cooks healthy when she can. I also admire her relationship with her dad since my dad and I have the same type of bond. I will let you all know when I try one of the recipes. Happy you're feeling better! 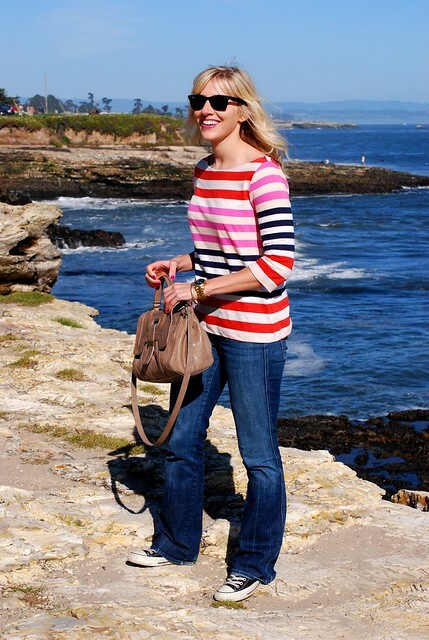 I absolutely adore that striped top - such happy colors! Love the striped top with the chucks--so cute. I wore the same H&M striped top to the Alameda Flea market yesterday except it looked a little different on my 30 week pregnant tummy! I love your top! I want to go to the beach. My weekend was spent cleaning and organizing. I thought I was the only one that kept all JCrew catalogs :) I love this outfit very Sunday . 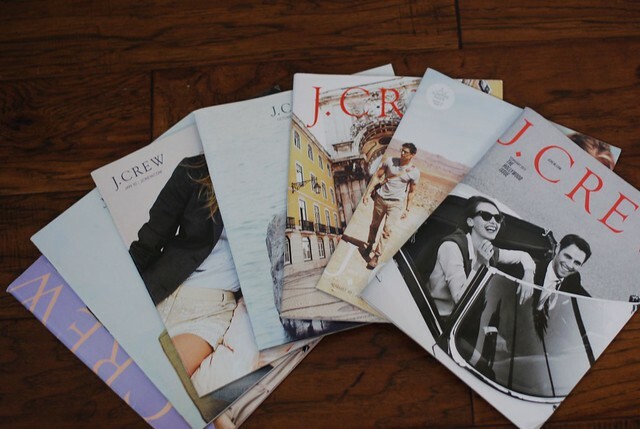 Yay for an afternoon of going over J.Crew catalogs! Sounds like the perfect weekend!! Great photos!! you look so cute in your chuck taylors and casual beach outfit!